I first saw Kenji Mizoguchi's 1953 masterpiece Ugetsu Monogatari (Tales of the Pale and Silvery Moon After the Rain) on Turner Classics one fateful idle afternoon earlier this year. San Francisco was socked in with fog and I was feeling under the weather. Invariably, I find myself drawn to vintage black and white films under such circumstances; they comfort me. With my honeyed Throat Coat cooling in front of me, I found myself disbelieving that so much beauty could pour out of my television set into my living room like the swirling mist on Lake Biwa, a beauty as fecund yet ethereal as the shadows of Lady Wakasa's Kutsuki mansion, ensorcelling me. I vowed to myself I would someday appreciate Ugetsu appropriately on a large screen. With the Pacific Film Archives' participation in the traveling "Unfolding Mizoguchi: Seven Classics" retrospective (currently in progress), and Shelley Diekman's gracious hospitality, my dream came true last Friday night. Watching Ugetsu projected larger than life was even more satisfying than I anticipated. I was struck by how there is not one superfluous moment in this film even as it is dense with detail. The script is exact and the editing perfect. It is, unquestionably, one of the most complete cinematic experiences I've ever had and it is certainly right up there—as it is for many others—in my top ten. It makes sense that so much has been written about this film—and such great commentary at that!—that it's nearly daunting to add even a sigh to the chorus of praise. I commiserated with Shelley—and she concurred—that it is much more difficult to write about a masterpiece than something less than perfect. Ugetsu has proven that fact. The thesaurus simply does not have sufficient superlatives. Once again, image proves itself superior to description. Still, it's the nature of our vocation to try. As Judy Bloch synopsizes for PFA's program notes: "In sixteenth–century Japan [the Senguko Era], with the pandemonium of civil wars a looming presence in their lives, the potter Genjuro [Mori Masayuki] and [Miyagi] his wife [Tanaka Kinuyo] long to be "rich and safe," respectively. But artistic vanity draws Genjuro into the paradisiacal realm of [Lady Wakasa] a phantom enchantress [Machiko Kyô]. 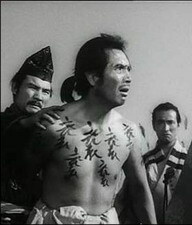 In a parallel tale, Genjuro's brother-in-law Tobei [Ozawa Eitarô], out for military glory, achieves a general's rank for his fraudulent exploits—another acrid apparition. In Ugetsu, the all-too-real and the supernatural move steadily toward each other; a boat ride on foggy waters foreshadows the horizontal unity Mizoguchi will give his two worlds. For, just as his images overflow with life—characters forever running off toward more life outside the frame—so this reality flows into the phantom universe as well. Mizoguchi builds an eerie netherworld entirely out of what he is given in this one: shadows and lighting, decor and texture, and the graceful chicanery of human desire." Written by Matsutarô Kawaguchi and Yoshikata Yoda, based on two of nine stories by Ueda Akinari (1768) and sumptuously photographed by Kazuo Miyagawa, Sarudama's Scott David Foutz has suggested that—for all those interested in the recent J-horror craze—Ugetsu is required viewing, being possibly the first in the genre and "perhaps the first film to fully depict a Japanese perspective of the supernatural and its meaning." Foutz opines that the film retains a unique freshness even after 50 years because, unlike current fare like Ringu and Ju-On, its elements were not sequelized unto banality. 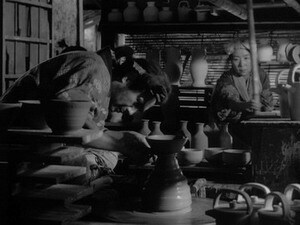 He further notes the effective balance between Ugetsu's contemplative depths and its engaging, steady action sequences. Slant's Eric Henderson distinguishes Ugetsu from other horror fare because it neither startles nor shocks, but purposely and systematically foreshadows "every revelation through internal, formal echoes." Criterion's dvd release of Ugetsu came in first place for the "DVD of the Year Award 2005" at Masters of Cinema and it's easy to understand why, though I've not had the opportunity to sample its many extras, other than for Phillip Lopate's exceptional essay "From the Other Shore", provided at the Criterion website. 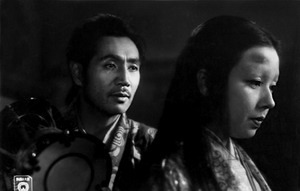 Lopate outlines how Mizoguchi "perfected his signature 'flowing scroll,' 'one shot–one scene' style of long-duration takes" with Story of the Last Chrysanthemums (1939) where "by keeping the camera well back, avoiding close-ups, and linking the characters to their environment, [Mizoguchi] generated hypnotic tension and psychological density." 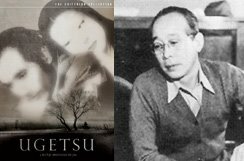 He describes Ugetsu as a "gender tragedy" where "men pursue their aggressive dreams, bringing havoc on themselves and their wives." 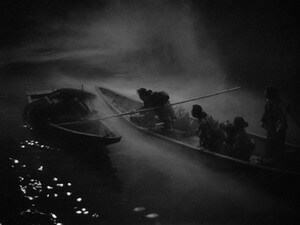 The first scene that mesmerized me was, of course, the "celebrated" Lake Biwa sequence where—reiterating Judy Bloch's apt description—"the all-too-real and the supernatural move steadily toward each other; a boat ride on foggy waters foreshadows the horizontal unity Mizoguchi will give his two worlds." Lopate concurs, stating, "the movie's supreme balancing act [is] to be able to move seamlessly between the realistic and the otherworldly" and describing the scene as "surely one of the most lyrical anywhere in cinema." Acquarello—who has written eloquently on several of Mizoguchi's films at his encyclopedic site Strictly Film School [which was just named one of the top five film journals by The Times UK]—understands the "coexistence between the physical and supernatural realm" in Ugetsu as "a reflection of the duality of the human soul." The Lake Biwa sequence is likewise narratively pivotal because—as Jared Rapfogel has written for Stop Smiling—shortly thereafter, "the four protagonists quickly splinter off, thanks partly to fate, partly to their own misjudgments, allowing Mizoguchi to create a rich and complicated structure, the separate stories paralleling and commenting on each other." Like those gorgeous painted Japanese scrolls that situate and diminuate humans against indifferent beautiful landscapes (and where the descriptive term "flowing scroll" derives), Mizoguchi achieves this effect through detailed background activity that did not register in the TCM broadcast but which dramatically drew into focus on the big screen, most notably in the scene where Miyagi is victimized by "the bestial behavior of the hungry, marauding soldiers"; a scene "shot from above, with a detached inevitability that makes the savagery more matter-of-fact, the soldiers pathetically staggering about in the background" while Miyagi, wounded, dies in the foreground. My colleague Frako Loden—who has singlehandedly taught me so much of what I know about Asian cinema, and who attended the PFA screening—was as thrilled as I was at this visual layering between foreground and background and its contextual landscape "surrounding human need." Frako also made it clear to me that Ugetsu was one of the first wave of Japanese films to truly influence the international cinema scene (including Akira Kurosawa's Rashomon (1950), Teinosuke Kinugasa's Gate of Hell (1953), and Yasujiro Ozu's Tokyo Story (1953)). By winning the Silver Lion at the 1953 Venice Film Festival, Ugetsu followed the European success of Rashomon (which likewise featured the remarkable Machiko Kyô) and confirmed the status of Japanese cinema in world film culture. Speaking of Machiko Kyô, Lopate astutely notes how Lady Wakasa's seduction of Genjuro involves not so much her own alluring Noh-masked eyebrow-smudged beauty, but her flattery of his craftsmanship. She snares him through his artistic vanity, raising him "from artisan to artist" and, thereby, placing them "on a more equal social footing." How else could a lowly peasant gain the confidence to accept the love of such an elegant lady? How else could we, as an audience, believe the "breathtakingly audacious" segue from their steaming bath together to their paradisiacal lakeside picnic, made all the more poignant for being illusory, transient, and subject to betrayal? Yet, "[w]hile all appearances are transitory and unstable in [Ganjuro's] world, there is also a powerfully anchoring stillness at [Ugetsu's] core, a spiritual strength no less than a virtuoso artistic focus." Roger Ebert recalls Pauline Kael's own reminisce of gasping when she heard Genjuro proclaim, "I never dreamed such pleasures existed!" Cinemarati's M.S. Smith quotes Susan Sontag as stating that the Japanese film tradition that includes Mizoguchi is "an incomparable model of beauty, moral seriousness, and emotional expressiveness in narrative art" and he articulates that "[i]n many ways, the experience of Ugetsu is one of visual and cultural immersion", which links into Mark Cousins' cover story for Prospect wherein he qualifies that the power of Ugetsu is not just in its amazing imagery but in the film's distinctive Buddhist and Taoist underpinnings which present a "different sense of what a person is, and what space and action are", thereby making them new to western eyes. Catherine Russell's Cineaste review of the Criterion release of Ugetsu is equally noteworthy for its examination of the literary and historical underpinnings of the film and goes into lengthy detail of the dvd's extras. Her essay highlights some tasty gossip about Mizoguchi as well. Phillip Lopate disagrees with Scott David Foutz that Ugetsu is—in essence—a cautionary tale. "Are we to take it, then, that the moral of the film is: better stay at home, cultivate your garden, nose to the grindstone?" Lopate enquires. "No. Mizoguchi's viewpoint is not cautionary but realistic: this is the way human beings are, never satisfied; everything changes, life is suffering, one cannot avoid one's fate." In his Senses of Cinema essay on Ugetsu Dan Harper relies on Donald Richie's definition of mono no aware: "that awareness of the transience of all earthly things, the knowledge that it is, perhaps fortunately, impossible to do anything about it: that celebration of resignation in the face of things as they are." This resigned acceptance of the way things are rather than an insistence on change and resistance to the status quo Harper identifies as one of the central themes of Japanese film. Harper likewise describes what I found magical about the spectral representations in Ugetsu, especially in the scene where Genjuro rejects Lady Wakasa. She reaches to touch him and then recoils in sad horror because of the protective markings on his skin. She steps away from him, her corporeality swallowed by a shifting of light into shadow. These are not "your typical movie ghosts—created through double exposure or other special effects" but evocations of light and shadow realized by Mizoguchi and his cinematographer, the "irreplaceable" Kazuo Miyagawa. The Mizoguchi-Miyagawa team create the same magic at the film's transcendent ending. Gary Morris's Bright Lights Film Journal profile of Mizoguchi culls out the biographical details that have influenced the helmer's oeuvre and he describes the film's ending: "Mizoguchi's ability to wring intense emotions from the smallest gestures is evident throughout Ugetsu, but particularly when the boy . . . goes to [his mother's] grave and puts a bowl of rice on it, the action punctuated by a simple bow, after which the camera cranes up and away. This scene works because of Mizoguchi's refusal to sentimentalize it, or any of the tragic events that preceded it." "Unfolding Mizoguchi: Seven Classics" continues at the Pacific Film Archives Friday evening, August 25, with screenings of Street of Shame and Sansho the Bailiff at 7:00 and 8:50, respectively, continues Sunday, August 27, with a 5:30 screening of The Life of Oharu, and concludes Wednesday evening, August 30, with a 7:30 screening of The Story of the Last Chrysanthemums. As mesmerized as Genjuro by the apparition of Lady Wakasa, I'll have to return to treat myself again and again to Mizoguchi's cinematic mastery. You should too. Cross-posted to Twitch, where Logboy has likewise posted on the dvd releases of the Mizoguchi material as well as providing some additional linkage to Mizoguchi write-ups out on the web.